8yo winning mare in foal to consistent sire Al Maher, who stands at Aquis. 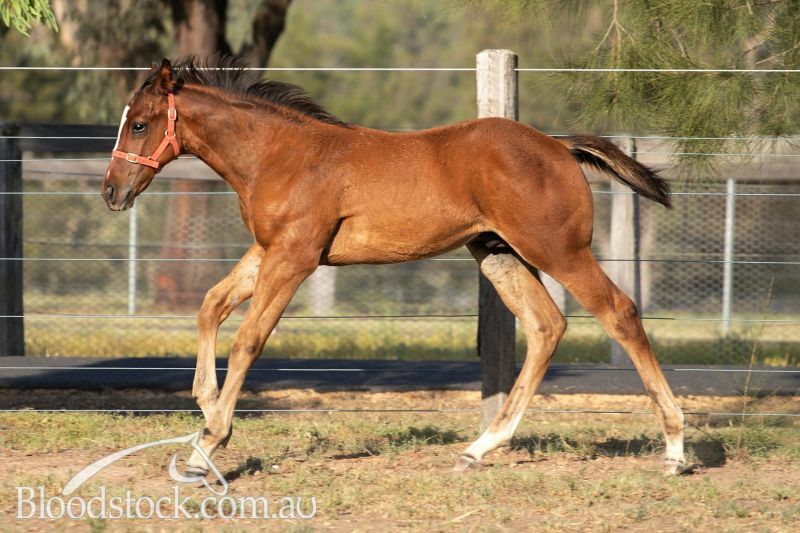 His yearlings at Magic Millions this year sold up to $190,000. By the ill-fated Norther Meteor, sire of 24 stakes winners, 6x Group 1 including the mighty Zoustar. 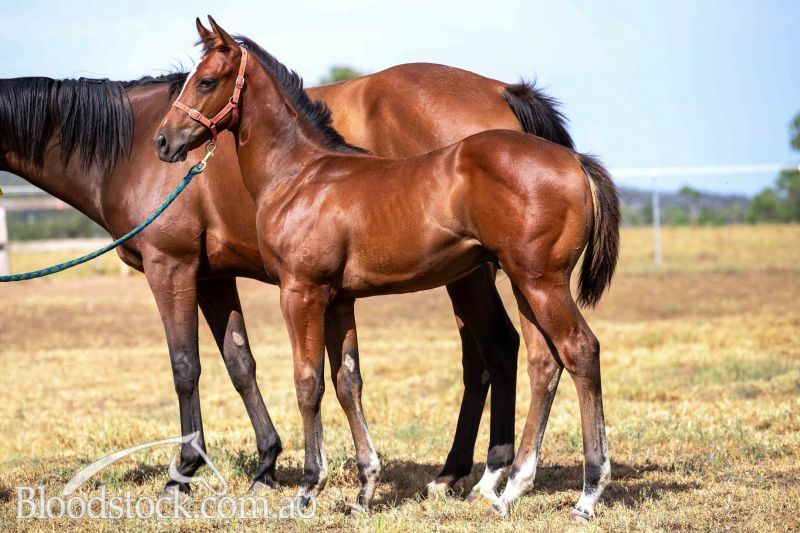 From a very active family, with progeny by or mares in foal to; I Am Invincible, Exceed and Excel, Hinchinbrook, Sebring, Russian Revolution, Capitalist, Vancouver, So You Think, etc. Nice type, correct, stands 15.2 1/2 hh. NORTHERN METEOR (AUS) (2005). 3 wins to 1250m, VRC Coolmore Stud S., Gr.1. Sire of 368 rnrs, 286 wnrs, 24 SW, inc. Cosmic Endeavour (Qld Tatt's RC Tattersall's Tiara, Gr.1), Zoustar, Speak Fondly, Romantic Touch, Shooting to Win, Amanpour, Deep Field, Eurozone, Bound for Earth, Runway Star, Burning Passion, Najoom, Metallic Crown, The Voice - Modern Tsar (H.K. ), etc. Sire of the dams of Point of Interest, Enrique Iglacier, No Regrets, Pirlo, etc. Lander Dollar (g by Snowland). 7 wins from 1100m to 1900m, A$137,750, Devonport Cup, TRC Kevin Sharkie H.-twice, Canteen Now What H., Betfair H., 2d TTC Steve's Liquor H., TRC Tile Centre H., 3d TTC Statewide Linen Service H., RF Fergusson H., Tasfresh H., TRC Programmed Turnpoint H.
Just So Bruno (g by Power of Destiny). 3 wins to 1550m in Aust. Talkingdol (f by Northern Meteor). 2 wins. See below. Our Snazzy Chassis (f by Onemorenomore). Winner at 1600m in Aust. 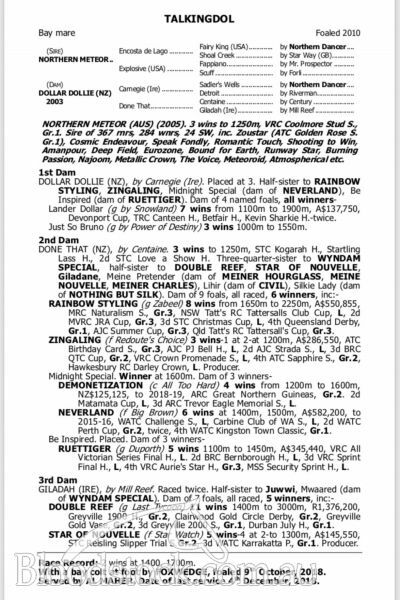 RAINBOW STYLING (g Zabeel) 8 wins from 1650m to 2250m, A$550,855, MRC Naturalism S., Gr.3, NSW Tatt's RC Tattersalls Club Cup, L, AJC TAB Jackpot Quaddie Welter H., MRC Catanach's Jewellers H., AJC The Chandon H., Marwin Gold H., Ashcroft H., Ipswich TC Optus Business Ipswich Mile H., 2d MVRC JRA Cup, Gr.3, AJC Australia Day Cup, L, 3d STC Christmas Cup, L, 4th Queensland Derby, Gr.1, AJC Summer Cup, Gr.3, Qld Tatt's RC Tattersall's Cup, Gr.3, Gosford Cup, L.
ZINGALING (f Redoute's Choice) 3 wins-1 at 2-at 1200m, A$286,550, ATC Birthday Card S., Gr.3, AJC PJ Bell H., L, Randwick Betting Auditorium 2YO H., 2d AJC Strada S., L, Hyde Park 2YO H., STC McGrath Foundation Ladies Lunch H., 3d BRC QTC Cup, Gr.2, VRC Crown Promenade S., L, STC Ambassador Travel H., TAB Number 1 Club H., 4th ATC Sapphire S., Gr.2, Scone RC Dark Jewel Classic, L, Hawkesbury RC Darley Crown, L. Producer. Jon Ron. 7 wins-1 at 2-from 1200m to 1600m, A$127,220, AJC Rick Damelian Honda Odyssey H., 2d AJC Spring H., Electronic H., 3d STC Sports Factory 2YO H., AJC Clifton Gardens H., STC Dooleys H.
DEMONETIZATION (g All Too Hard) 4 wins from 1200m to 1600m, NZ$132,625, to 2018-19, ARC Great Northern Guineas, Gr.2, Counties RC Haunui Farm H., BOP RC Fertco S., 2d Matamata Cup, L, Counties RC Franklin Long Roofing H., 3d ARC Trevor Eagle Memorial S., L, Waikato RC CK Treeworks H., 4th ARC Easter H., Gr.2. 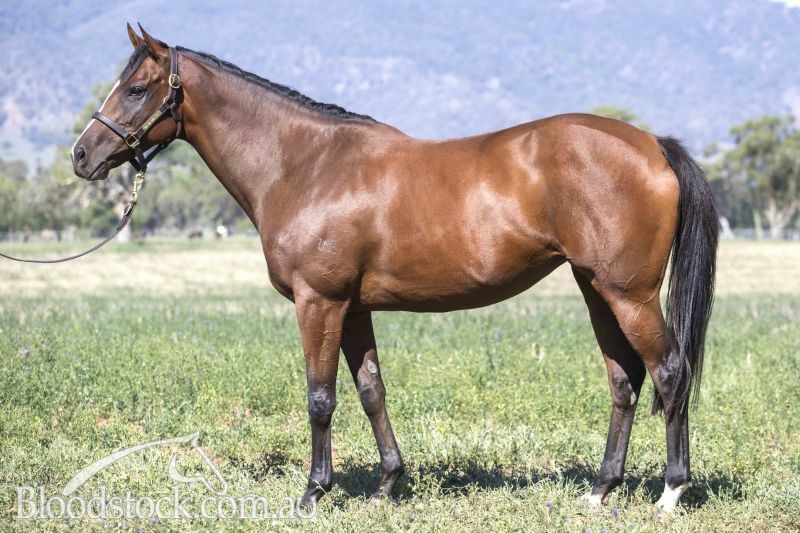 NEVERLAND (f Big Brown (USA)) 6 wins at 1400m, 1500m, A$582,200, WATC Challenge S., L, Carbine Club of WA S., L, Weddings at Perth Racing H., Scarboro Toyota H., Westspeed H., 2d WATC Perth Cup, Gr.2-twice, Ascot One Thousand Guineas, L, ATA S., L, 3d WATC Natasha S., L, 4th WATC Kingston Town Classic, Gr.1. RUETTIGER (g Duporth) 5 wins to 1450m, A$347,940, VRC All Victorian Series Final H., L, MRC The Cove Hotel H., 2d BRC Bernborough H., L, SAJC Brian Vivian's 70th Birthday H., 3d VRC All Victorian Sprint Final H., L, Sensis Digital Trophy H., Midwest Bellarine H., MVRC GJK Facility Services H., MRC Grand Hotel Frankston 2YO H., Darwin TC Palmerston Sprint H., MVRC Art Series Hotel Group H., MRC Off the Track H., 4th VRC Aurie's Star H., Gr.3, MSS Security Sprint H., L.
DOUBLE REEF (g Last Tycoon (Ire)) 11 wins from 1400m to 3000m, R1,376,200, Greyville 1900 H., Gr.2, 3d Greyville Durban July H., Gr.1. STAR OF NOUVELLE (f Star Watch) 5 wins-4 at 2-to 1300m, A$145,550, STC Reisling Slipper Trial S., Gr.2, 3d WATC Karrakatta P., Gr.1. Producer. Giladane (c Danehill (USA)) 5 wins at 1300m, 1400m, A$86,455, WATC Fremantle H., 3d WATC Quality S.H., Gr.3. MEINER HOURGLASS (c Brian's Time) 6 wins-1 at 2-from 1600m to 2100m, 227,717,000¥, Hanshin Sirius S., Gr.3, 2d Funabashi Diolite Kinen, L-twice. MEINER CHARLES (c Brian's Time) 4 wins-2 at 2-at 1800m, 2000m, 207,756,000¥, Nakayama Keisei Hai, L, Hochi Hai Yayoi Sho, L.
MEINE NOUVELLE (f Brian's Time) 3 wins-2 at 2-at 1800m, 2000m, 126,656,000¥, Nakayama Flower Cup, L. Producer. CIVIL (g Woodman (USA)) 5 wins from 1100m to 2500m, A$187,340, Balaklava Cup, L, SAJC Allan Scott Park Morphettville H.
Cape Breton (g Peintre Celebre (USA)) 6 wins from 1300m to 3200m, A$425,550, BRC Queensland Cup, 2d Queensland Derby, Gr.1. NOTHING BUT SILK (f Belong to Me (USA)) 5 wins at 1000m, 1200m, R246,600, Kenilworth Sceptre S., Gr.2, Southern Cross S., Gr.3. Producer. Race Record: 2 wins at 1450m, 1700m in Aust. 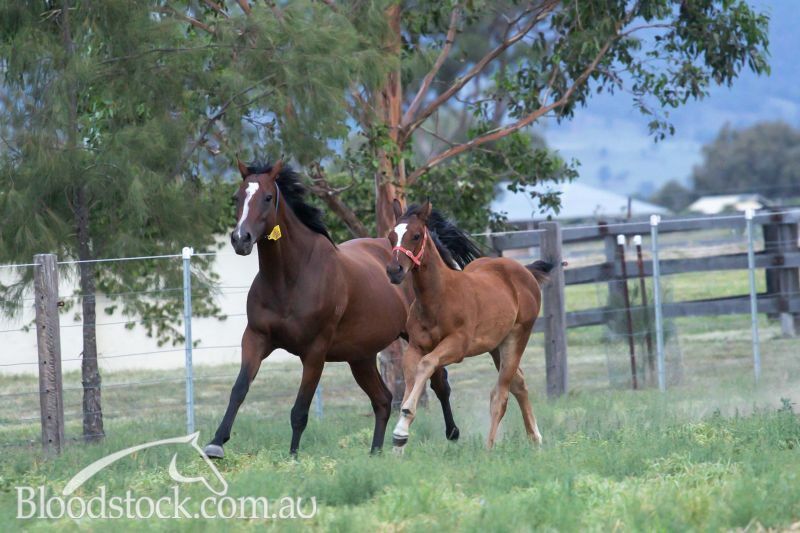 Produce Record: Dam of 1 foal. Served by Al Maher. Date of last service, 04.12.2018.